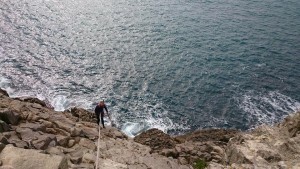 ‘Nuts and Bolts’ of Climbing in Swanage. It’s tricky for a French girl! I’ve recently been introduced to the beauty of climbing in Southern England. The climbing here never ceases to amaze me and definitely keeps me on the tip of my toes. So it has been a completely new adventure in its own right to climb in Southern England. A bit like learning a new sport. I have so far only managed to explore ‘crags’ on the Jurassic Coast in Swanage and Portland, so my experience here is still extremely limited. This is a completely new and exciting journey which is very different from the humble climbing I have accomplished previously. 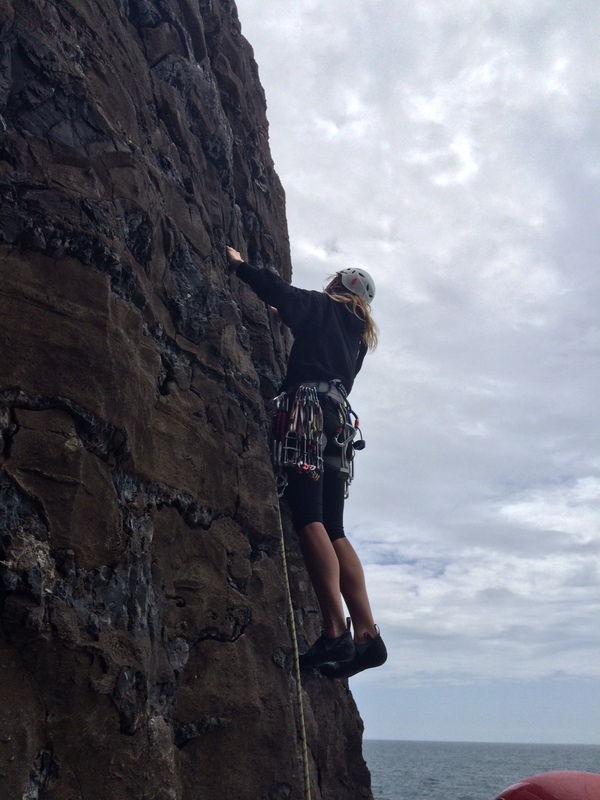 It is an adventure I enjoy and I embrace every opportunity to go climbing there. 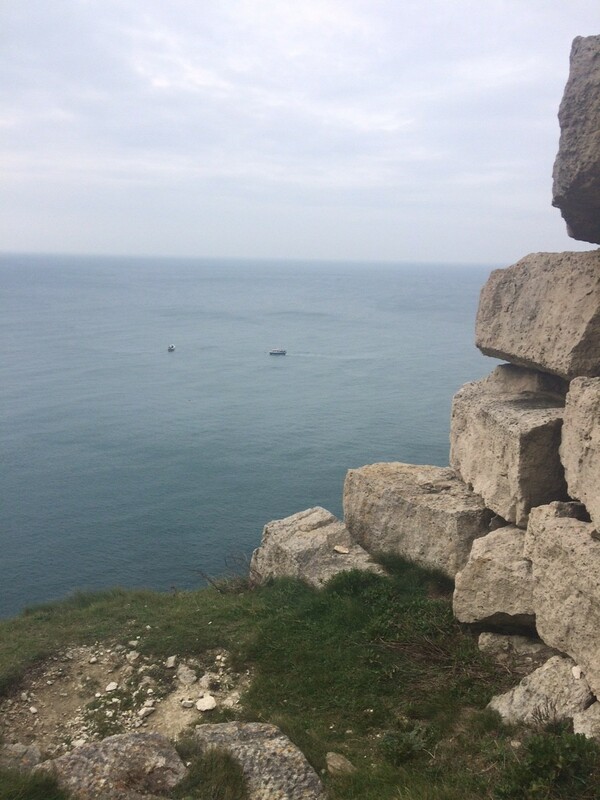 On the Jurassic coast, the walks on the coastal path and scenic trails to access climbing sites, aka crags, are worth the journey in itself. 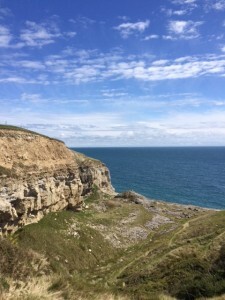 The views of green rolling hills and cliffs overlooking the sea are stunning in Swanage. 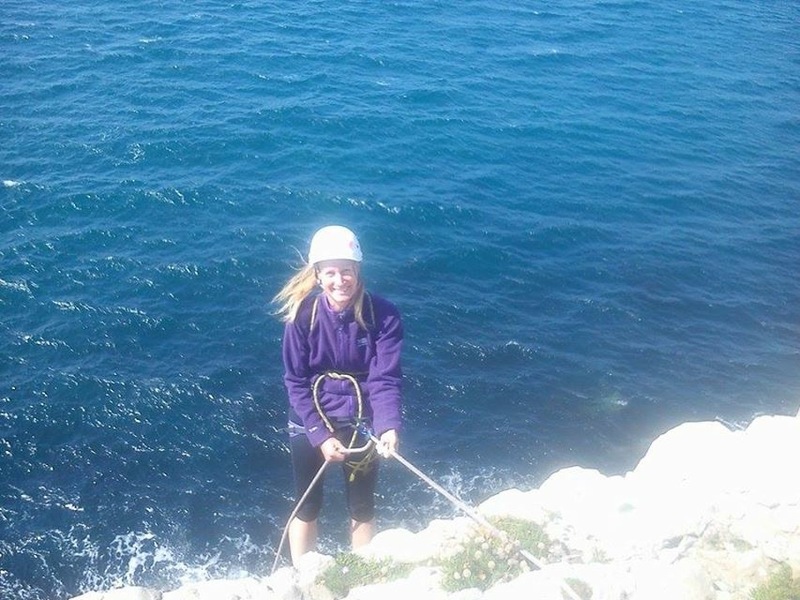 In order to reach the bottom of most trad routes in Swanage, you need to either ‘scramble’ (this has nothing to do with how you like your eggs! 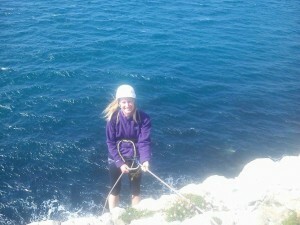 – it’s a very easy down climb to the bottom of the cliff – without being secured by a rope) or ‘ab’ down (abseil) the cliff. Every single descent is a truly special moment. This is where it really starts to feel amazing. My senses are overloaded by the scenery: the vastness of the sea surrounding us, views of the Isle of Wight in the distance and the sound of the crashing waves. Tip: Don’t lose your route! 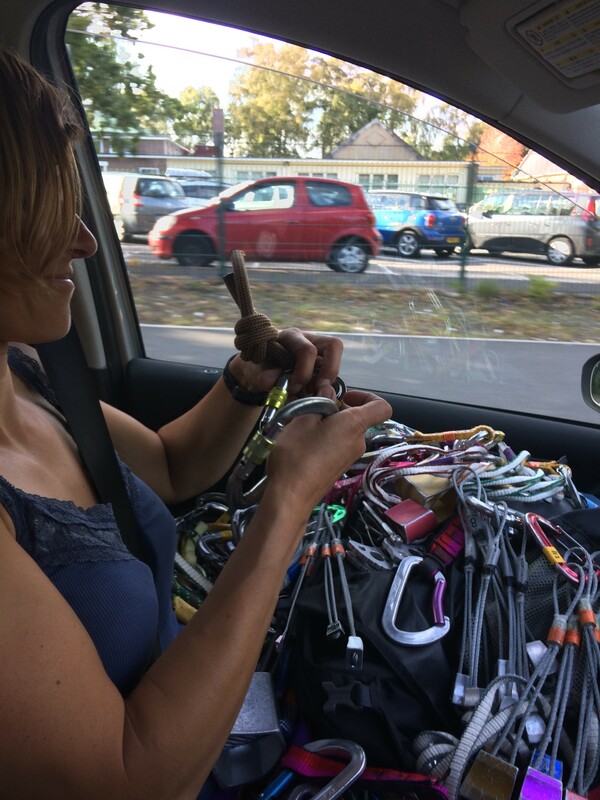 Another Tip: In some cases, stakes or pegs have been placed at the top of the crag and can be used to set up your anchor for the abseil. In other cases, there are no stakes/pegs and you will need to set up your anchor at the top using protection gear. The style of climbing on some of the sea cliff routes is very different from that of my modest climbing experience in France. Some of the climbs are ‘trad’ (for traditional) climbs where the leader has to place their own protection gear in the rock to protect against a fall. 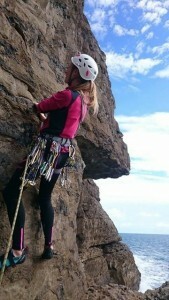 So unlike sport climbing, bolts haven’t already been placed in the rock on the route. I believe that for many years, in the UK, it was deemed unethical to place bolts and traditional climbing was favoured for its ethical purity. For me, the discovery of trad climbing has brought climbing to a whole new level. Secondly, this new style of climbing is playing tricks with my mind and definitely testing my mental strength. 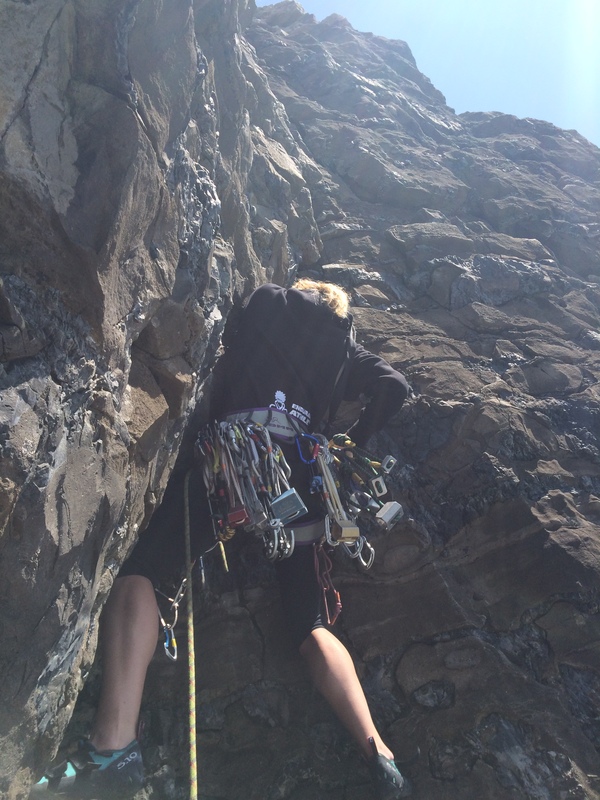 As I’m climbing, I can’t stop thinking about the gear I placed below and whether it is ‘bomb proof’. If I take a fall, will the gear hold me? Or will it just come out and tumble down the cliff with me? I have to admit I found it quite unnerving when on some occasions I hear one of the nuts I placed below come out, whilst I am still climbing higher. I then feel a sudden urge to place an extra piece of gear, just in case….! Tip: British climbing guides provide descriptions of the routes along with its dual grading system. Well worth a read before you head out to the crag. The ‘adjectival grade’ provides an assessment of the overall difficulty of the route including how exposed it is, how sustained it is, what quality is the rock, etc….. This normally gives me a good indication of my fear to come and how much my heart will flutter during the route. The second part of the grade is the actual technical difficulty of the ‘crux’ (aka the hardest move) on the route (for example 6a). Another Tip: When choosing your route, keep in mind you will be several kilos heavier when you climb! This is due to all the kit you need to carry with you (normally 3 to 5kg)! You will need to decide carefully how much gear to bring with you. 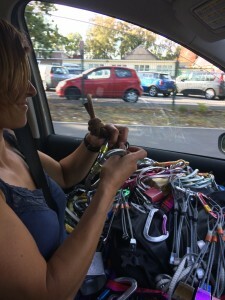 In addition to quickdraws, you may also need to take nuts, hexes, cams, slings, screwgate crabs (karabiners) and your bug (ATC belay device). Also, sorting the gear ahead of time is always a good idea! 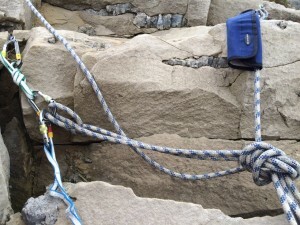 One More Tip: Depending on the number of attempts and whether you have watched another person climb the route, you can either climb it on-sight (free climbing a route without falls, without prior inspection, from bottom to top aka the “purest” way to do a route), flash (leading the route without falls after having received beta of some form) or redpoint (leading a route after inspecting it and/or after practising individual moves). 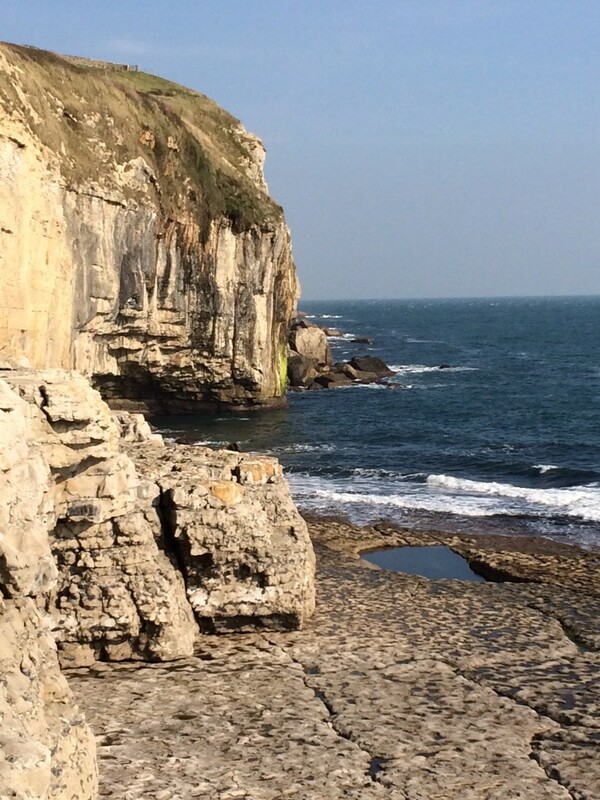 Most crags on the sea cliffs on the south coast are made of limestone. The cliffs aren’t very tall and the majority of routes in the area are single pitch, meaning there is no need to set up a stance to get to the top of the crag. The landscape is changing so quickly in the area due to the weather conditions. The rain, wind and storms are causing occasional landslides and rock falls. This means the crags are evolving constantly. Last Tip: Just in case you can’t wait to join the fun too, make a note to check the tides before you leave. In extreme weather the lower ledge of some of the routes can be submerged in a strong swell. 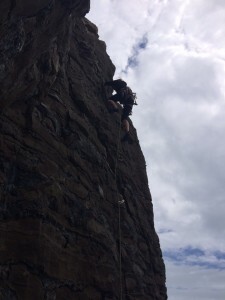 I’m keen to explore more crags in the UK, learn about different climbing styles, send new routes (this has nothing to do with Royal Mail 🙂 Send=complete), and embrace the UK climbing culture. I enjoy each and every trip to the outdoors and I can’t wait for the next adventure at the crag!